By almost two to one, government employees in the United States exceed those in the manufacturing sector. Numbers supplied by the Bureau of Labor Statistics (BLS) and reported by blogger Terence Jeffrey show that federal, state, and local governments employ 21.9 million versus 12.3 million employed in manufacturing. Is it any wonder that America is slowing down? Manufacturing continues its downward spiral, which will be made even worse with Obama’s trade agreements (Photo by V4711 (Own work) [CC BY-SA 3.0], via Wikimedia Commons). Wealth is productivity. A nation is wealthy whose people use the raw materials of the earth to produce goods. Government workers, frequently impeders of wealth producers, do not produce goods and do not create wealth. BLS data shows that 1989 was the year when the number of government workers first exceeded the number making things. That year has been followed by steady growth in number working for government and a steady decline in the manufacturing field where the things Americans expect to use are made. Over the past 25 years, 4 million more have found jobs for government and 5.6 million have been forced out of manufacturing. Their manufacturing jobs went to Mexico, China, Bangladesh, and plenty of other nations whose wealth is increasing while the wealth of the United States is evaporating. What does the Obama administration offer to address this problem? More entanglements called trade agreements that will, like NAFTA, result in more manufacturing jobs being lost here and gained elsewhere. Jeffrey notes that, in 1941, there were 12.8 million workers in the manufacturing sector out of a population totaling 133.4 million – a ratio of 1 person in manufacturing for every 10.6 counted by the census. But in mid-2015, that ratio had shifted from 1 person making things for every 26 people in the nation. The goods Americans want and need are coming from elsewhere. Nothing is being done to reverse the downward trend that gets worse year after year. If the U.S. doesn’t rebuild its manufacturing sector and shrink the number of government employees, the entire nation will suffer because the few who still produce goods will be taxed to keep the burgeoning rolls of government employees happy. And they will eventually cease producing. We repeat: Wealth is productivity. Government workers, only some of whom are needed, don’t make things and many of them stand in the way of those want to be manufacturers. Candidates for high office should take note of these simple facts before there are so many government employees, who are unlikely to vote for anyone wanting to reduce government employment numbers, that a continuance – or even a speeding up – of America’s downward spiral will be our fate. For more on how money, banking, and the Federal Reserve affect our economy, view Dollars & $ense. When the federal promoters of comprehensive new laws and regulations started running into trouble with their claims about global warming, they decided to give their pet project a new name. So, the claim known as “global warming,” resoundingly denied by increasing numbers of weather experts, became “climate change.” The switch is designed to confuse people into accepting a variety of drastic measures to combat a non-problem that will regulate how they live. Burn coal to produce electricity? It has to stop. Outlaw the combustion engine that’s in your automobile? That’s what these environmental dictators want. Al Gore actually called for such a measure in his book “Earth in the Balance.” He urged effort toward “the strategic goal of completely eliminating the internal combustion engine.” Doing so would surely impact people who use automobiles. Would it affect the earth’s climate? Competent scientists say no. But now, the climate change experts are frightening people with their new terminology, not about global warming. These are the areas that the United Nations thinks world government should control in the name of sustainable development. How many of these areas are even under the purview of the U.S. Constitution? (Image by United Nations (http://www.globalgoals.org/#the-goals) [Public domain or CC0], via Wikimedia Commons). In 1992, the United Nations issued the massive Agenda 21, a comprehensive plan to enact controls over all human activity. The John Birch Society exposed this incredibly draconian drive toward what has been termed “sustainable development,” and people began to oppose its implementation. So a new plan that isn’t really new but a rehash of Agenda 21 has emerged. Its name is “Transforming Our World: the 2030 Agenda for Sustainable Development.” Will changing the name of this totalitarian plan change what was intended? Of course not! But the general public is supposed to think the new program doesn’t aim at a loss of freedom, the actual goal. President Obama and Secretary of State John Kerry recently produced a treaty with Iran supposed to keep that country from producing a nuclear weapon. Any treaty, of course, is supposed to require two-thirds approval by the U.S. Senate. Knowing that they couldn’t get that many senators to go along, they renamed it a “deal” that requires only a majority. But it’s still a treaty. Giving this dangerous proposal a new name is designed to get approval by Congress while it fools the American people. Social Security has been renamed a “Federal Benefit Payment.” But it’s not a “federal benefit.” It’s money forcibly extracted from wages and employers and it’s owed to the people whose money was taken from them over their lifetime. The enormous “Food Stamp” program is a form of welfare given to tens of millions, even to illegal immigrants. It has come under fire in recent years for its enormity and widespread fraud. So its name got changed as well and is now the “Supplemental Nutritional Assistance Program,” SNAP for short. Will it still make millions of people dependent on government? Yes. Will the program still be replete with vote-buying fraud? Yes indeed. Finally we turn to the granddaddy of all the name changing and twisting of definitions: inflation. It is not and never has been rising prices, which is what the government and the mass media want everyone to believe. Instead, inflation is creation and use of more unbacked money that dilutes the value of existing money. Prices don’t go up. The value of money goes down. More of it is needed to buy anything. Those who believe inflation is rising prices likely blame the grocer, the gasoline supplier, or the landlord. In the process, the government and Federal Reserve that caused the dollar’s value to shrink get off without a worry. Switching names and promoting false definitions has become common. The American people have to be told how they’re being conned. Then, they’ll no longer be victims of clever but sinister name changes and word games. Capt. Kristen Griest, Class of 2011, West Point. (By U.S. Army photo by Staff Sgt. Steve Cortez/ Released [Public domain], via Wikimedia Commons). Recently, news reports flooded the nation about two women soldiers who had passed all requirements and were now Rangers, the Army’s elite group of warriors. All Americans were supposed to cheer their accomplishment. But one of the two, both of whom graduated from West Point, stated in an interview that she certainly couldn’t lift the amount of weight her male counterparts could. No one in the large gathering of media representatives pressed this new Ranger even though she should have been asked whether she can manage to carry one end of a stretcher bearing a wounded comrade on the way to a medical station. Then, she should have been asked if her natural female cycle that brings to most women such consequences as depression, mood swings, suicidal thoughts, self-abuse, and more that men don’t experience. Did she know that when acceptance of women at the nation’s service academies began, physical standards were lowered? Had she read former infantry officer Brian Mitchell’s 1989 book “Weak Link: The Feminization of the American Military” where he noted that when women recruits couldn’t complete a required run in boots while carrying a rifle, the new standard allowed both women and men to perform the task in sneakers? Many more questions that should have been asked can be cited but none were offered. 1st. Lt. Shaye Haver, Class of 2012, West Point. (By U.S. Army photo by Staff Sgt. Ron Burgundy/ Released [Public domain], via Wikimedia Commons). Having served three years as a lieutenant in the U.S. Marine Corps gives this writer an excellent perch from which to answer the question, “Should women be placed in combat roles in the military?” And the answer is “No!” Serving in our nation’s armed forces should never be looked upon as a right possessed by everyone. Instead, it’s a privilege, and it should be awarded only to those who qualify – mentally, physically, and emotionally. No woman should have the right to go into combat simply because she desires to do so. It’s a matter of jeopardizing the lives of soldiers who depend on all members of the team to do their full share, and of the right of every American citizen to have the strongest national defense possible to protect his and her freedom. A highly decorated Vietnam veteran, Gatsis had already witnessed situations where female soldiers even in non-combat situations couldn’t lift heavy equipment, drive a truck through rough terrain, erect bulky tents, dig latrines, or construct ammunition bunkers. He insisted that the violence always present during combat “calls for force, and force requires physical strength” that women don’t possess. Current presidential candidate James Webb, a Vietnam veteran, spoke out about this issue in his 1989 article entitled “Women Can’t Fight,” published in Washingtonian magazine. There are many more reasons why females should not be assigned combat duty. Plenty of opportunities to serve in uniform exist in a variety of non-combat assignments. The current policy that leads to opening every position in the military should be reversed. A likely enemy would send only men while our men in battle would invariably be forced to carry not only their assigned load but also a portion of whatever is expected of a woman. Unit morale, the fundamentally important motivator of all troops in battle, would surely suffer. We conclude: Women can serve in the military but placing them in combat is not only foolish, it endangers all participants. 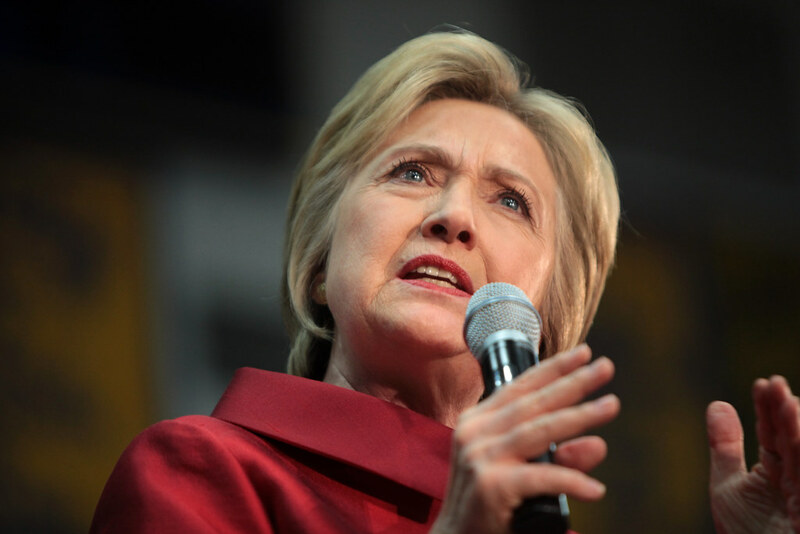 No one should downplay the revelations about former Secretary of State Hillary Clinton’s misuse of her private email account to transmit and receive sensitive government-related messages. The matter is important, of course, because whatever she sends and receives via an unsecured private computer can easily be hacked by enemies of our nation. “That was a mistake. I’m sorry about that. I take responsibility.” -Hillary Clinton (Image from Flickr by Gage Skidmore Some rights reserved). Press reports have recently confirmed that Mrs. Clinton’s technician has cited his right under the Fifth Amendment to avoid self-incrimination. More questions came to her during an Associated Press interview where she insisted, “What I did was allowed.” Then, she took questions from NBC News veteran Andrea Mitchell and responded that she was “sorry that this has been confusing to the people and has raised a lot of questions.” The people were wrong, she inferred, not herself and her misuse of computers. But there’s a far more important matter no media star seems willing to raise. Early in 2015, Mrs. Clinton moseyed down to United Nations headquarters in New York where she spoke to an adoring crowd at the Sixth Annual Women in the World Summit. She pandered to the assemblage of gay, transgender, and abortion advocates, and then while referring to the American people, she forcefully insisted, “Deep-seated cultural codes, religious beliefs and structural biases have to be changed.” She obviously wants to abolish the fundamental moral and religious foundation that contributed mightily to the building of our nation. Her intentions in this area are enormously more important than her misuse of computers. America has always been known as a nation whose admirable reliance on “cultural codes” and “religious beliefs” enabled the people to govern themselves. But all of this must go claims Mrs. Clinton. By ignoring her extremely revolutionary attitude, self-important media stars indict themselves. Yes, they should press her about her casual and potentially dangerous handling of email. But let the American people know how truly un-American she really is.